Serve a winning menu with simple and easy Super Bowl party food ideas that will delight any guest and allow you time to enjoy the big game. Throwing a Super Bowl party is about more than just the game. Good friends and plenty of food are a must to make any party a success. Party food need not be a hassle but something that can be prepared before your guests arrive and taken out once everyone is hungry. No one wants to be slaving away in the kitchen while the game is on and the guests are cheering for their favorite team, so keep it simple to ensure a good time is had by all. There are endless Super Bowl party food ideas to consider. If you plan your party food menu in advance, it is easy to keep it simple and do the work ahead of time. You can save yourself not only time but also stress. 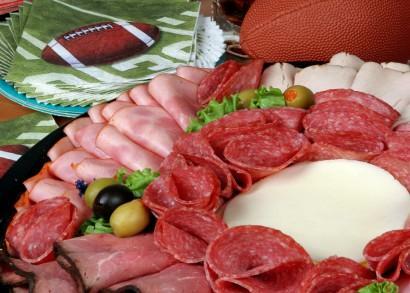 Deli tray with a selection of meats and cheeses. Serve with condiments and fresh buns. To go one step further bake a ham or turkey to use as your meat. Vegetable platters along with dip are a hit at any party. Finger foods are not only easy to serve but can be filling. Offer a range of items such as chicken wings, Swedish meatballs, potato skins and mini pizzas to satisfy your guests. To accompany the dips serve tortilla chips, warm pita triangles and a selection of fresh vegetables. If cooking a meal is too much to handle, ordering pizza is always an option. Order several types so that there is something for everyone. To complement the pizza, serve a salad with a variety of dressings. To impress your guests, consider making your own pizzas. Either make the dough by hand or purchase pre-made shells. The extra effort is sure to be a treat that will be appreciated and enjoyed by all. Another creative twist to consider is setting a theme for your Super Bowl party and using food that ties into the theme. For example, a Mexican theme can feature tacos, nachos and burritos as food items. A picnic theme could use burgers and hot dogs as part of the menu. Of course, no party is complete without a sweet ending. Desserts can be tied into the party's theme. Decorate cookies, brownies or cupcakes in your team's colors or choose a cookie in a football shape. A sheet cake that is decorated like a football field and accented with footballs is another cute idea to consider.